The sharp increase in unemployment began in early 2008 and didn't improve until well into 2009. The trends are down except in the "alternative" calculation, potentially worrisome if it implies a huge shadow inventory of people waiting to start seeking employment again once there is a glimmer of economic improvement. If so, it will make for an even longer recovery. 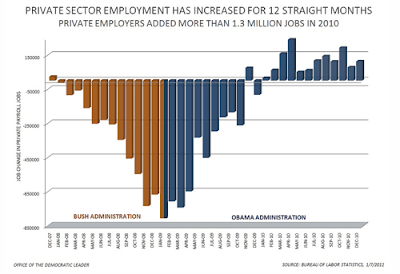 Both graphs would look better were it not for the net reduction in government jobs over the past 3 years. Part of what makes this recovery so "jobless" is the relentless drum-beating for government austerity, i.e. the laying off of workers in the public sector.